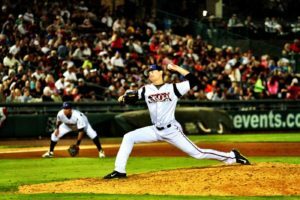 Former Lipscomb pitcher Chris Nunn thought his professional baseball career was over on multiple occasions. He was released by San Diego, Milwaukee and Houston. He left the game in 2016 to pursue an MBA at Lipscomb. He nearly lost vision in his right eye after taking an elbow to the face in a pickup basketball game. And, recently, he had to deal with his mother’s breast cancer diagnosis. But on Jan. 28, the 28-year-old inked a minor league contract with the Texas Rangers, who project him to begin the season with Triple-A Nashville – a two-mile drive from his apartment in The Gulch. How did Nunn get here? And how, after all this time, is he back within striking distance of a life-long dream that seemed to be long lost? It took a change in his mindset and workout philosophy, an increase in pitch velocity and a little help from Twitter. It’s a 35-degree January day in Nashville, and Nunn is scrambling to get a quick bullpen session in at Lipscomb’s Ken Dugan Field, a place that “feels like home” to him. He’s working against the clock, because his former college team will be using the field that afternoon. 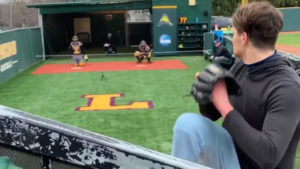 Lipscomb pitching coach James Ogden lets Nunn use the team’s facilities provided that the current players take precedence. The hurler grabs Lipscomb junior Jarrett O’Leary to be his catcher, only to find out that the radar gun in the bullpen needs a new battery. Odgen promptly fixes that issue to bring Nunn’s workout to life. This isn’t supposed to be any type of show. Nunn is slowly working his way back to game speed in just his fifth bullpen session of the offseason. He hasn’t thrown harder than 90 mph since the season ended last September, he admits. After getting loose, he realizes this could be a special day. Nunn has Chris Kachmar, a senior pitcher, film the workout with an iPhone. Despite the frigid temperatures, Nunn said he feels like he’s in the zone. Ogden said he thinks this has a lot to do with Nunn’s maturity, as many younger pitchers tend to use the elements as an excuse. Nunn isn’t bothered – his mindset is different this time around. Nearing 30, Nunn knows this season could be his last shot. Four pitches make the cut for the final video. The radar gun reads 96, then 97, then 98, then 99. “Do you get that?” Nunn asks his makeshift cameraman. “I got all of it,” Kachmar answers. Nunn’s bullpen session quickly blew up on Twitter. He tagged Rob Friedman, known as the “Pitching Ninja,” who created the Flatground app to connect pitchers with college and professional scouts. Friedman’s goal is to give exposure to underappreciated and unknown talent. The initial video drew over 376,000 views, and subsequent videos have drawn thousands more. A left-hander throwing 99 mph in the dead of winter is an enthralling sight. Ironically, this wasn’t Nunn first viral sensation at Ken Dugan Field. 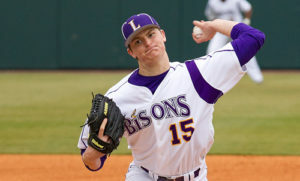 While pitching for the Bisons in May 2012, he made a behind-the-back grab on the mound after a ball was smoked up the middle by a Jacksonville batter. The play made No. 9 on SportsCenter’s Top 10 plays that evening. Nunn’s latest viral video also caught the attention of the important people. Five scouts trekked to Nashville to see Nunn for themselves, and offers rolled in from Miami, Minnesota, Tampa Bay, Toronto and Texas. The Rangers ultimately landed him, and they plan to use the hard-throwing lefty as both a starter and reliever, according to Nunn. Texas is just the latest in a line of seven organizations (five affiliated, two independent) to take a chance on Nunn. He wants to make this opportunity count. “It’s time to do it,” he said. Nunn’s career has been full of twists and turns. After three seasons at Lipscomb, San Diego selected him in the 24th round of the 2012 MLB Amateur Draft. He then spent the next four seasons working his way through the Padres’ system, reaching as high as Double-A San Antonio in 2015. But Nunn’s performance on the mound simply wasn’t up to par. 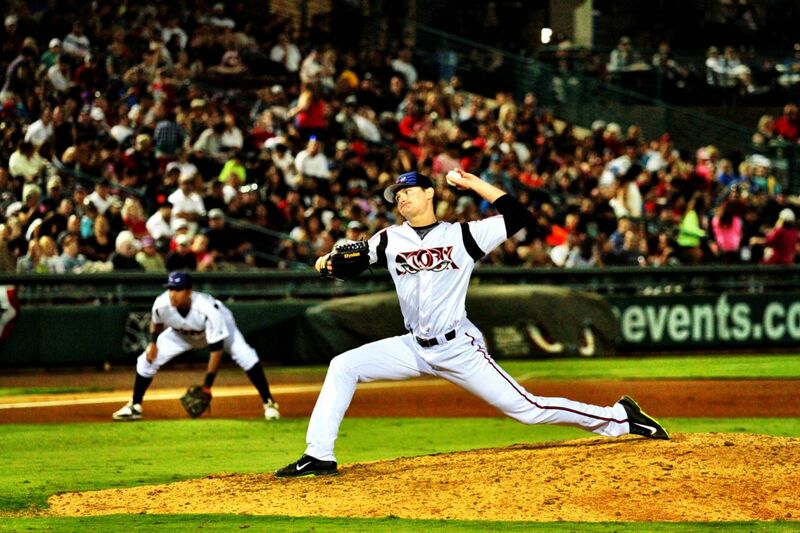 He finished that year with a 7.03 ERA in 47 relief appearances split between Class A Advanced and Double A. The 6-foot-6 hurler struck out 51 batters in 56 innings, but he also gave up 68 hits and issued 51 walks. After what he said was a “bounce-back” performance in 2016 Spring Training, Nunn was released. The San Diego front office had experienced a major overhaul, and many of those who believed in him had been sent packing. Nunn did not pitch anywhere in 2016. Instead, he explored options beyond the baseball diamond. It didn’t take long for Nunn to realize he wanted to make a comeback. He wasn’t ready to hang up his spikes just yet. But life is never that simple. While playing pickup basketball in his hometown of Memphis in September 2016, Nunn took an elbow straight to his eye socket. The damage required reconstruction surgery on the right side of his face. The recovery process was grueling. Doctors said he was fortunate to regain his full eyesight. As it turned out, that darkness was a blessing in disguise. Nunn had to rely on his instincts to get around – his eyes alone weren’t getting the job done. When he was able to return to the mound several months later, that same mindset translated to his pitching. Nunn posted a bullpen session on YouTube in late March 2017 (the internet has been kind to his career), and the Milwaukee Brewers quickly scooped him up and put him in extended spring training. The stint proved to be short lived. Nonetheless, Nunn continued to persevere. He joined some friends on the Lower Antioch Dodgers of the Middle Tennessee Adult Baseball Association – a league filled with local college players and those still clinging to their glory days. He landed with the Evansville Otters of the independent Frontier League. One dominant performance – he struck out nine batters and allowed just one run in five innings – was all it took to interest the Chicago Cubs, who were in desperate need of late-season pitching help in their system. 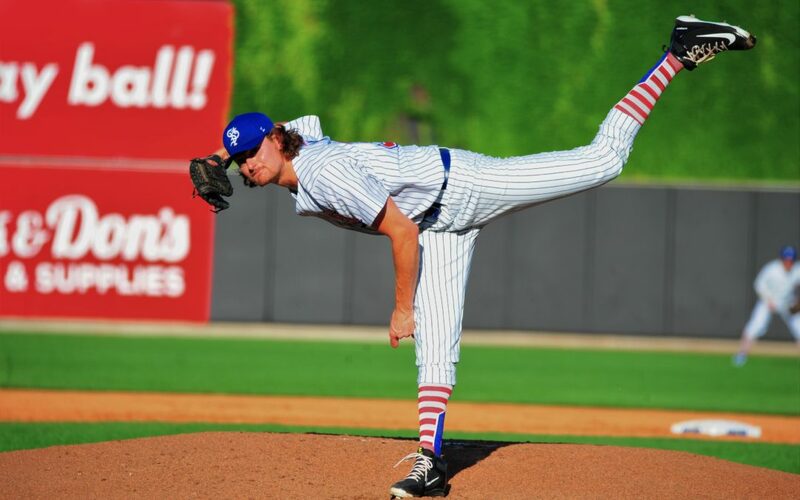 Nunn made four appearances for the Double-A Tennessee Smokies and performed reasonably well. 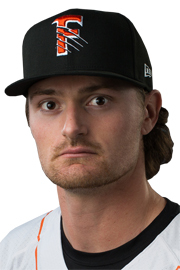 He tossed 17 innings and struck out 14 while maintaining a 4.76 ERA, which was enough for the Houston Astros to select him in the Triple-A phase of the Rule 5 Draft that offseason. He bounced back-and-forth between Double-A Corpus Christi and Triple-A Fresno before the Astros cut him last June. Nunn was dominant in his 20 innings in Double A, but his velocity wasn’t where Houston expected it to be. From there, Nunn decided to reinvent himself once again – this time as a starter for the St. Paul Saints of the independent American Association. The gamble worked. He went 7-3 with a 3.05 ERA in 59 innings pitched. The laid-back atmosphere at St. Paul, which averages 8,000 fans per game, proved to be beneficial for Nunn’s psyche. There wasn’t any pressure from an MLB parent organization. He just went out and threw. When Nunn reports to Rangers Spring Training on Feb. 17 in Surprise, Arizona, he’ll do so with thoughts of home on his mind. 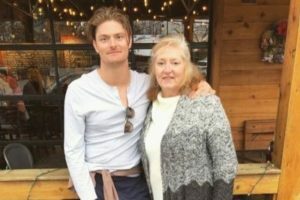 His mother, Diane, was diagnosed with breast cancer last November. She had the tumor removed the day before Thanksgiving and began chemotherapy one day before Nunn received his offer from Texas. If all goes according to plan, Diane will have plenty of chances to see her son play close to home. Nashville is just under three hours away from her Memphis residence, and Nunn’s Sounds visit the Memphis Redbirds on Mother’s Day (May 12) and on Diane’s birthday (June 26). A large group from Highland Street Church of Christ (located in Cordova) is expected to join her at AutoZone Park. In addition to his changed mindset, Nunn is also physically stronger this time around. Hitting 99 on the radar gun wasn’t something that happened by accident. Nunn spent time this offseason at Resilient Health and Performance in Brentwood to improve the mobility and stability of his hips. The early results have been promising, as shown by his upper-90s velocity in the viral Twitter video. As for Nunn’s chances of making it to The Show, Ogden still sees it as a real possibility. Nunn said he understands there’s still work to be done. He must prove to the Rangers that he belongs in Triple-A. He must maintain the high velocity. He must keep confident in a game that has pulled the rug out from under him so many times. If he can do those things, who knows? Crazier underdog stories have happened.